Some parts of Pikmin 2 were only available before the final release, and have been changed or removed for the final version. This information is known from different sources, like gameplay videos or screenshots of earlier versions of the game. Although the exact versions are not known, they are commonly called "beta", "alpha", or "pre-alpha" versions by fans, depending on how complete the game looks to be. There is also some unused content inside the final copies of Pikmin 2, and some of it helps understand what type of content was meant be available for the full game; for such a list, see the unused content page. The HUD has no icons for Louie. Captain Olimar's icon on the HUD is the same as the icon from Pikmin. The spray counters show the existence of an unknown yellow spray. The day counter is taken from Pikmin, since the "d" in "day" is still lowercase. The Pikmin counter has leading zeros, which, depending on the images, are see-through or fully opaque. The sublevel counter says "floor" instead of "SUBLEVEL". Areas are vastly simpler and less detailed, and have different layouts on certain parts, but most textures have a higher resolution. Purple Pikmin are still purple, but their main color is black, and because their HUD icons have not been made yet, the game uses a Yellow Pikmin's icon colored partially gray as a placeholder. A treasure resembling the Pink Menace can be seen, but it has a blue heart, a different shaped frame for the jewel, and is not found on the Valley of Repose. The Rubber Ugly's texture and model was different. An unknown treasure for a rusty can without a label exists, inside a cave. The carrying numbers use the same color scheme as in Pikmin. Large yellow Bulborbs can be seen on some areas and caves. Close-up of the Burgeoning Spiderwort mold. The HUD differences can be clearly seen here. Fighting an Empress Bulblax. Compared to the previous image, the leading zeros on the Pikmin count are transparent. Carrying berries. This section of the Awakening Wood looks emptier and has simpler-looking floor tiles. Other Burgeoning Spiderworts, on the area that contains the entrance to the Snagret Hole. The section containing the Snagret Hole of the Awakening Wood. A Spotty Bulbear in a large patch of water in a section of the Perplexing Pool. The location of the screenshot appears to be to the left of the landing site. This particular screenshot indicates almost the entire area to the back of the landing site was raised out of water at this stage in development. The entrance to the Shower Room. A Male Sheargrub can be seen where there are none in the final game. The plastic pipe also faces another way, while an island not present in the final version, presumably from the The Distant Spring can be seen. The early cave model can be seen here. An early ring treasure, similar to the Pink Menace. Note the high quality wall texture behind the leaders. The Rubber Ugly, with a different texture. The Valley of Repose's manhole, with a different look, and a cave entrance. There is also a crosswalk marking missing in the final game. An unknown rusty can treasure. The HUD version is presumably the first one, given the carrying numbers. The leaders' icons are the same as in the final version, except the bottom of their images poke through the bubble they are in. The spray counter has a purple dot for the ultra-bitter spray without the spray having been collected. In the final game, the dot only appears if the spray was unlocked. It is possible to grow more than 20 Red Pikmin (at least 26) on day 1. At the Valley of Repose. The leaders' icons go past the bubbles they are in. Near the main lake of the area. The shore to the lake looks simpler than the final game. The first day. Note how the player has 26 Pikmin, whereas in the final game, they can only grow 20. Only the ultra-spicy spray is unlocked, but the ultra-bitter spray's purple dot can still be seen. A large yellow Bulborb, on the top-left corner. Two Bulborb subspecies are known to have been cut from the final versions of Pikmin 2, from analysis of gameplay videos and screenshots. These Bulborbs, along with the Red Bulborb, would have given each basic Pikmin type a Bulborb of the same color, had they not been removed. Naming used in the game's data makes it clear that these enemies eventually became the Dwarf Orange Bulborbs, Orange Bulborbs, Snow Bulborbs and Hairy Bulborbs in the final game. A blue "dwarf" Bulborb is clearly seen in a gameplay video. It has white spots, and apparently acts like the Dwarf Red Bulborb, with the same health, attacks and weight. Its treasure value, however, appears to be × 5, whereas Dwarf Bulborbs are worth × 2 in the game's released version. An adult version was never shown. These blue enemies became the Dwarf Orange Bulborb – whose internal name is bluekochappy – and the Orange Bulborb – with the internal name bluechappy. Yellow Bulborbs appeared in the same video as the blue one, but in an above-ground area that bears a striking resemblance to The Forest of Hope. A dwarf version was also seen, which seems to walk slower than other Dwarf Bulborbs. In the final game, Snow Bulborbs are internally called yellowkochappy and Hairy Bulborbs are called yellowchappy. A sleeping large yellow Bulborb, on the top-left corner. Olimar appears to be in the Awakening Wood. A bridge can be seen leading up to the small cliff in the background, which happens to have Burgeoning Spiderwort mold on top of it. The Awakening Wood's textures look a lot more dead and closer to the The Forest of Hope, with less grass. A white gate is present where the second white gate would be located in The Forest of Hope. A debugging error handler is running, and in the footage, has captured a problem: WARNING [system.cpp:593] DVD LOADING. MAIN THREAD!!. This problem disappears once the player starts moving inside a cave. 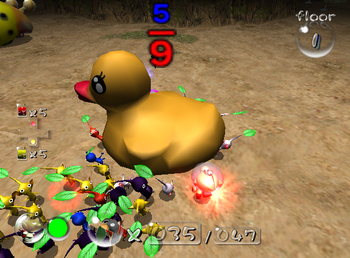 The player is seen moving near a mature Yellow Bulborb and some yellow dwarves. Two sprays exist, one red for , likely the ultra-spicy spray, and an unknown yellow one for . The camera can zoom in much closer. Leading zeros appear on the HUD's numbers, but are almost invisible. Louie's icon and health indicator do not appear on the HUD. Olimar's icon on the HUD is the same one as the icon in Pikmin, as opposed to a brand new one. The standby Pikmin icon for the Yellow Pikmin is much paler than in the final game. While entering a cave in what is probably the Awakening Wood, a large, solid red box appears in the background, with the text "956*90" appearing on its side. A large sleeping Red Bulborb can be seen behind it in the distance. The cave entrance cutscene starts to slow down with time, and eventually ends before all Pikmin enter. There is also no saving afterwards. When landing in a sublevel, the text "floor 1" appears on-screen, in a much different fashion from the final game (which would show the cave's name in one line, and "Sublevel 1" in the next). This text stays on-screen even during gameplay. There is no HUD besides this text. The sublevel landing cutscene is a bit different, and only contains the part where the camera is already at ground-level. The squad starts a little into the cave, not under the Research Pod. Purple Pikmin stems glow green when idle. The cave presented in the video uses a soil theme, with black walls, but a cavern skybox, which looks very jarring. Boulders fall without warning, and look unfinished, as they do not rotate as they hit the ground, and lack particle effects. The Rubber Ugly has a slightly different look and is just slightly buried in the ground. A Lapis Lazuli Candypop Bud instantly changes to a Golden Candypop Bud and back again. This is probably an early Queen Candypop Bud. The landing spot below the Research Pod is a green circle, and the Research Pod itself is a very simple plain dark red. These could be lighting problems, however. The location, shape, and size of the red "956*90" box indicates that it's probably a very early version of the paper bag. The placement of the gate that is placed similarly to the second white gate located in The Forest of Hope is indicative of normal land instead of a water pit (with a bridge) in the Awakening Wood. This video shows an early version of the Challenge Mode. In this one, the mode develops in the Awakening Wood (called "Challenge Level" here), making it very like the Challenge Mode from Pikmin, with the exception that the player is able to use sprays. This version of the game only has three menu options: "Main Game", "2-Player", and "Challenge". The jingle played by the ship's dialogs is more monotone and bland. The ship gives a plain overlook of the game's plot. The Awakening Wood is simply just known as "Challenge Level". The Awakening Wood is vastly different from the final game, likely made that way for demonstration purposes. Like in the previous video, the HUD's numbers have leading zeros, although sharper, and Louie's icon and health are not visible. There is a section in the area's theme where the oboe's notes are quarter notes, whereas they are eighth-notes in the final game. Gates have a health wheel. When Pikmin attack something, the spark particles they create are larger and more opaque than in the final game. A white gate is present where the first white gate was located in The Forest of Hope. A Cloaking Burrow-nit can be seen behind the first white gate. A cave can also be seen. Three various 10 pellets are scattered throughout the level. One red 10 pellet is right behind the white gate, and the other two blue and yellow pellets are outside, to the left. An electric gate is found where the clog in a plate is located. The clog that would be by the electric gate is not present. A Seeding Dandelion is prominently displayed on the ledge near the plate. Another one can be seen behind the white gate. Three Burgeoning Spiderwort molds can be seen in the plain near the start of "Challenge Level". As made evident through the locations of the plant pots and the lack of a dirt ramp near the pots, this map uses the Piklopedia version of the Awakening Wood. A Rubber Ugly can be seen behind a Hermit Crawmad hole. Notably, the presenter seems to quickly reveal the objects with a audible "yay" by quickly pointing the camera at the objects and then looking away before the video cuts away. Interestingly, the presenter erroneously calls Olimar "Omar" and believes Louie is his wife. This video was found on a demo disk released only in Japan and is dated January 2004. The level design and object placement indicate that this might be a slightly later version of the game than the one shown in the E3 2003 Challenge Mode gameplay. A song using what appears to be a more monotonic, earlier version of the Hocotatian motif is playing throughout the entire trailer. Olimar and Louie land together. All of the Piklopedia versions of the areas are seen used. Another early paper bag can be seen. This version of the paper bag appears to be a wide seesaw block. A flattened and lowered version of this wide seesaw block can be seen in the final game's Piklopedia version of the Valley of Repose, as part of the level model and exactly in the same spot. Red Pikmin are found in the real landing site of the Valley of Repose. A Withering Blowhog and a Ranging Bloyster can be seen in the Perplexing Pool. The multiple Hermit Crawmads at the back of the area are additionally not present, as they would be in the spot of the Ranging Bloyster. The landing site for this version of the Perplexing Pool is where the Yellow Pikmin are found in the final game. Notably, this appears to show trunk walls present in the Perplexing Pool's Yellow Pikmin landing site, but not in the Piklopedia version of the Perplexing Pool, indicating that the Perplexing Pool shown here may have some changes, even when compared to the in-game Piklopedia version. A cave is present on top of the manhole in the Valley of Repose. It is not visible, although its particle effects and sound effects can be seen and heard. This change is present in one of the New Play Control! Pikmin 2 official website screenshots. A cave is found to the left of where the Submerged Castle would be located in the Perplexing Pool. Olimar and Louie are in the Awakening Wood on day 2, indicating that the Awakening Wood was to be unlocked after the first day of the Valley of Repose, or that the Emergence Cave was to be entered on day 1. A Spotty Bulbear is seen on the Awakening Wood. Burgeoning Spiderworts are present in the open plain in the Awakening Wood. These are the same ones visible in the E3 2003 Challenge Mode gameplay footage. It seems that an Empress Bulblax producing Bulborb Larva is found in the final floor of a six-floor cave. No six-floor cave in the final game has an Empress Bulblax on the last floor, so the cave shown here is presumably an early Hole of Beasts with an extra floor missing from the final game. Additionally, if this cave is the Hole of Beasts, it appears as if the coding for the Empress Bulblax to not produce children is not present in this version. Olimar and Louie seem to have just Yellow Pikmin and Red Pikmin on day 2. Given the location of an electric gate to the left of the location of the Geographic Projection, along with the early landing site of the Perplexing Pool, the Yellow Pikmin were probably meant to be found in the Awakening Wood, perhaps in the original spot that the Yellow Pikmin were found in The Forest of Hope. What appears to be a slightly large seesaw block in the original location of the Submerged Castle is present, but it is impossible to discern if it is exactly a seesaw block, due to the cropping. Olimar and Louie land together, and this along with the location of the Red Pikmin and the used level model (which doesn't have Louie's crash site) indicates a much different tutorial, presumably one where the ship doesn't crash into a tree, although it is not shown. The usage of the Piklopedia version of the Valley of Repose also indicates a different location for the Courage Reactor, as it would have to be in Louie's crash site, which doesn't exist in this version of the map. The long seesaw block's presence and appearance in the Valley of Repose indicates that there might be another linking seesaw block on the map. It might also be that there is no other linking seesaw block on the map, which is probably the reason why it was changed into a paper bag; to avoid confusing the player. A trailer showed at E3 2004 shows little noteworthy information, except for the fact that Blue Pikmin were able to enter the Lost Toy Box. The first Japanese trailer shows an Emperor Bulblax eating Pikmin with a swipe of its tongue. Only eight Pikmin get caught, even though the cap is nine Pikmin in the final game. It is not clear if the attack in the clip simply failed to gather the maximum number of Pikmin possible, or if the maximum used to be eight, but was changed to nine. The Piklopedia and Treasure Hoard versions of the areas have carrying paths used in the Pikopedia for path-following enemies like the Spotty Bulbear and the Waterwraith. On top of that however, they're designed strangely with one-way points leading into walls, down from cliffs that any leader or grounded enemy couldn't reach, or converging toward sections of the map, which hints to earlier layouts of the areas playable in the final game. These are probably the version shown on the January 2004 Japanese Demo Disk. Paths for bridges that would be placed similarly to the bridges leading up to the Sagittarius in The Forest of Hope are present. They are converging through the apparent bridge locations and towards the landing site. Paths converging at the location that is surrounded by cobblestone walls is present, presumably indicative of an early Onion location or a failsafe if a gate was not broken down. There are three points leading downwards from the cobblestone walls towards the location. Where the Bulblax Kingdom would be located are points leading out to the east. The points that would allow the Air Brake in the final Awakening Wood to be carried down are not present. The wall formed from three stump walls and grass to the west of where the Glutton's Kitchen would be located in the Perplexing Pool has a point leading down from it, indicating a early treasure location. There are points for a bridge going over a pit to the west of the real landing site and lead northwards. The two unconnected waypoints to the north of the Shower Room entrance are now connected and point south. The routing is apparently converging towards the center of the area, where the Yellow Pikmin landing site is located. As can be seen in the January 2004 demo disk, Onions were parked at this very spot, indicating that the landing site was apparently located in the center of the map. Routing that would lead treasure towards the final landing site is not present for the locations of the Impediment Scourge, the Gherkin Gate, and presumably the Onion Replica. Indeed, there is almost no routing at all at the section of the map with the Gherkin Gate, except for routing that leads out of the small pit leading into water. This may be indicative of an early treasure location. An earlier version of the Challenge Mode from the E3 2003 build. An earlier version of a 2-player mode. Note that the rusty cave units shown here have much higher walls. An earlier location for the Empty space container. The leader icons cut off outside of the bubbles. 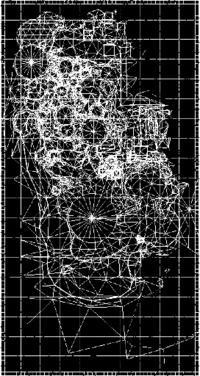 The wireframe texture used in-game. In the background of the Piklopedia and Treasure Hoard menus, there is a wireframe texture that depicts the Perplexing Pool seen from above. This wireframe does not match the final Perplexing Pool, but is fairly close to the Piklopedia/Treasure Hoard version of the area. Notably, the landing site is a large circle instead of a large concrete arena. That said, there are still differences between the texture and the Perplexing Pool model used in the final game's Piklopedia. For one thing, any artificial objects such as the entire shower floor section where the Shower Room and the random large objects strewn around the landing site are completely missing. The texture also shows an island(with a high polygon count presumbly, as it is almost completely white) to the southeast of the landing site where no such island exists, and has a big open space at the south; these are like remnants from The Distant Spring. The Yellow Pikmin site seems to have walls, but this is unclear. A ramp to left of the landing site that is present in a prerelease screenshot is also present. Finally, most of the out of bounds areas seem to be heavily unfinished. The prerelease version of the Regal Diamond. In the Official New Play Control! Pikmin 2 website, there are some pieces of artwork for a handful of treasures. 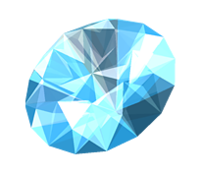 Among them is the Regal Diamond, but it is colored light blue, as opposed to the gray coloring in the final game. ↑ YouTube video showing the blue dwarf Bulborb. This page was last edited on March 24, 2019, at 10:40.